In the photo part of the player's stance in the bunker is in casual water, but their ball does not lie in casual water. a) May the player choose to make their stroke anyway? b) May the player drop their ball in the bunker within one club-length of the nearest point of relief from the casual water, without penalty? 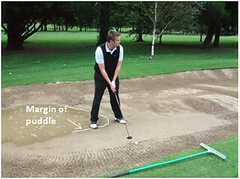 c) If the player chooses to take relief and when they drop their ball it embeds into the soft sand may they re-drop it? d) May the player choose to drop the ball outside of the bunker under penalty of one stroke? a) Yes, it is not mandatory to take relief from an abnormal ground condition. b) Yes, this is one of the options under Rule 25-1b (see below). c) No, there is no relief for a ball that is embedded in a bunker; the player must play the ball as it lies following the drop. d) Yes, this is an option afforded by Rule 25-1b(ii)(b), (see below). (b)Under penalty of one stroke, outside the bunker, keeping the point where the ball lay directly between the hole and the spot on which the ball is dropped, with no limit to how far behind the bunker the ball may be dropped. Note: If a player opts to drop their ball in a part of the bunker that affords maximum available relief from the casual water they may not then invoke another option because they do not like the result. They must play the ball as it lies or declare it unplayable and choose one of the options under Rule 28, for a penalty of one stroke. Decision 25-1b/9.